Bon, une fois installé, et vos sources applicatives pretes à etre “repackagées “ au format APPX, voila ce que la documentation MSDN nous dis..
COMMENTAIRES : Minimum Windows Version requirement is met. COMMENTAIRES : Required feature is enabled. COMMENTAIRES : Checking Windows SDK version to ensure it meets minimum requirements. COMMENTAIRES : Attempting to set appx manifest property ‘PackageName’ to ‘ISOCreator’. COMMENTAIRES : Attempting to set appx manifest property ‘Publisher’ to ‘CN=TEST’. COMMENTAIRES : Attempting to set appx manifest property ‘Version’ to ‘0.0.0.1’. COMMENTAIRES : Attempting to set appx manifest property ‘PackagePublisherDisplayName’ to ‘CN=TEST’. COMMENTAIRES : Attempting to set appx manifest property ‘PackageDisplayName’ to ‘ISOCreator’. COMMENTAIRES : Attempting to set appx manifest property ‘AppDescription’ to ‘ISOCreator’. COMMENTAIRES : Attempting to set appx manifest property ‘AppDisplayName’ to ‘ISOCreator’. COMMENTAIRES : Attempting to set appx manifest property ‘AppId’ to ‘ISOCreator’. recent one compatible with your version of Windows. COMMENTAIRES : Isolated Installer Run Complete! 1.0\IsoCreator.exe. Testing that path to ensure the executable is there. 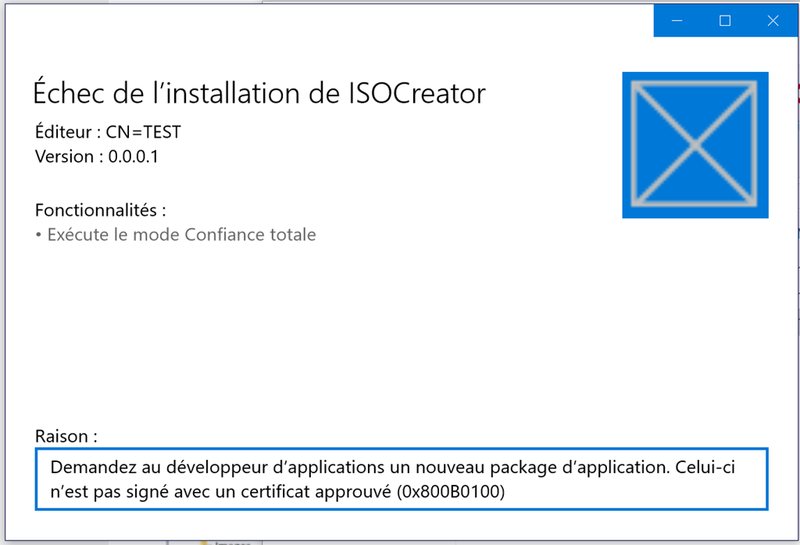 1.0\IsoCreator.exe) is a valid path. COMMENTAIRES : AppInstallPath was not specified. Trying to determine the AppInstallPath from AppExecutable path. ‘C:\vfs0\Program Files (x86)\Bunny-Wabbit\ISO Creator 1.0\IsoCreator.exe’ can run as a 32-bit or 64-bit application. Forcing 64-bit application package for converter compatibility. Use the ‘-PackageArch x86’ command line parameter to create a 32-bit application package instead. COMMENTAIRES : No file type associations to add. COMMENTAIRES : No protocol associations to add. COMMENTAIRES : Could not find any startup task shortcuts. COMMENTAIRES : No startup tasks to add. COMMENTAIRES : No app execution aliases to add. COMMENTAIRES : Targeting appx manifest for x64 processor architecture. COMMENTAIRES : Conversion complete. Your converted application is located at C:\tmp\ISOCreator. Managed executable ‘C:\vfs0\Program Files (x86)\Bunny-Wabbit\ISO Creator 1.0\IsoCreator.exe’ can run as a 32-bit or 64-bit application. Forcing 64-bit application package for converter compatibility. Use the ‘-PackageArch x86’ command line parameter to create a 32-bit application package instead. 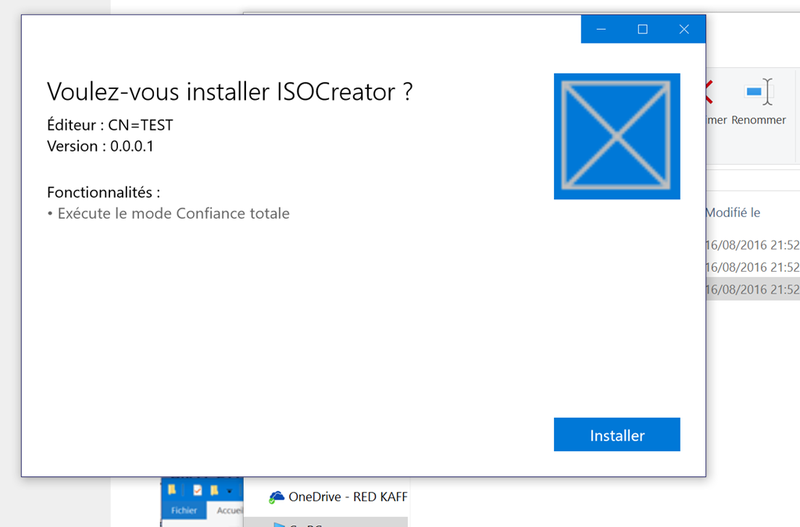 le CN indiqué dans la syntaxe faisait mention d’un CN=TEST, qui bien sur n’est pas fonctionnel ici, il faudra regénérer un package soit avec un certificat de votre PKI interne, soit en utilisant Signtool.exe du SDK de windows. Mais le process de conversion fonctionne apparement bien…à valider sur un environnement complet afin de pouvoir tester les limites de cet outil. Cet article, publié dans ADK, centennial, Deployment, Formation, ICD, MDT, Scripting, Storage, est tagué APPX Conversion, Centennial Project, Convert to APPX, create APPX, ICD, MSI to APPX, PPKG, Projet Centennial, tools. Ajoutez ce permalien à vos favoris.